Northern Ireland is gearing up to host the Giro d’Italia this weekend. Of course the race will be filled with top professional cyclists from across the world, but many more people will take part in volunteering and support events, such as the Chain Reaction Big Italian Bike Ride. Action Mental Health (AMH) are one of the official charity partners of this event which will allow over 1,000 local cyclists to take in parts of the Grand Depart route the week before the big race. Clients of our QUEST project on Foyle have just completed a 6 week hiking and cycling course with Far and Wild (farandwild.co.uk) which took place on Sunday mornings and challenged them both physically and mentally. Local man Damian Bonner has qualified as an instructor and clients are completing Level 1 and Level 2 Cycling Proficiency. They will also be starting Bike Maintenance shortly. Clients are able to borrow 2 bikes from the service to use in their own free time. Three clients have bought their own bikes. The cycling was based in the City and routes were focused on the banks of the Foyle taking in both the East and West banks of the river and the beautiful Peace Bridge. 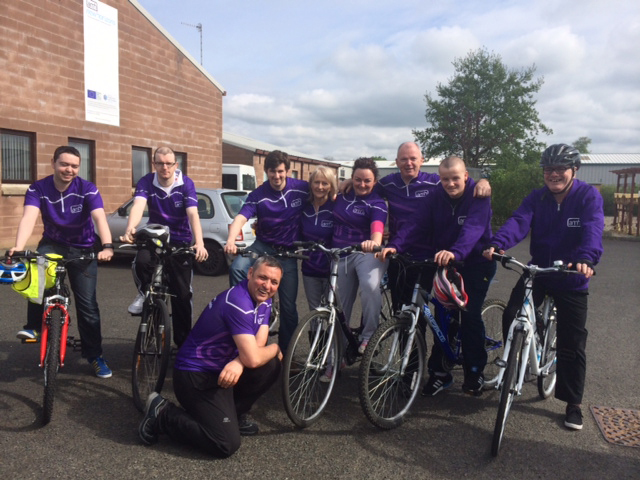 Initially clients seemed apprehensive as some of them had not been on a bike in years. One client quipped “there is no chance I am getting on this thing, it has been 30 years since I was on a bike and I am over 18 stone!” The same client cycled 9 miles on day one and said he felt great afterwards. Physical health and mental health are inextricably linked. People affected by mental illness experience much poorer physical health than the general population. Likewise, poor mental health is associated with an increased risk of heart disease, cancer and diabetes. Research tells us that physical activity is effective in the treatment of clinical depression and can be as successful as psychotherapy or medication, particularly in the longer term. It may also help people living with anxiety and stress disorders and can have a positive effect on psychological wellbeing in people with schizophrenia. Rhythmic aerobic forms of exercise – such as cycling – appear to be the most effective in achieving mental health benefits. Physical activity is increasingly being used in rehabilitation programmes for people with specific conditions, or in programmes to help people recover from substance abuse. This is why AMH’s involvement in events such as the Bike Italian Bike Ride and our own Granite Challenge each October, are obvious partnerships for us. Action Mental Health has a long history of physical activity for mental health recovery and this special year of cycling is no exception.